Last week, I really unpacked the topic of understanding stress and interrupting it in your daily life. 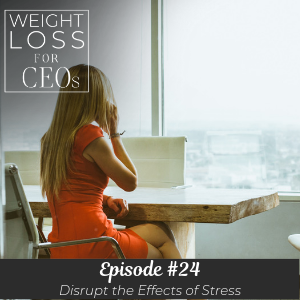 Well, sticking with my favorite topic of discussion, this episode is all about those stress cycles we find ourselves in, what a profound effect they can have on our mind and body, and how we can disrupt them. I know in my own life, when I had a stressful day, I’ve always loved to reach for a glass of wine or some rich food. This always results in waking up the next morning feeling groggier than I really care for. Does that sound familiar? We all have a tendency to buffer, especially when winding down at the end of a trying work day… But is it helping us? Tune in this week to discover how the ways we choose to try and relieve stress in the short-term (usually the easy ways) are contributing to our inability to cope with this strain in the long-term. I’m sharing three steps, plus a bonus method, to make sure you’re dealing with the stressful occurrences in your life in a way that promotes long-lasting wellness. I’m starting live webinars on the topics of weight loss and stress. If you want to be included, sign up on my homepage or shoot me an email! Why we put ourselves in stressful cycles. How we can notice when we’re choosing to put ourselves into these stressful cycles. What we can do to disrupt those cycles for the benefit of our stress levels. How some people get trapped in using the adrenaline of stress to motivate themselves. Why the way we comfort ourselves short-term is contributing to our long-term stress. 3 steps to keep you from buffering now and suffering later. Good morning, my friends. I am, again, very excited about bringing you my favorite topic. And I think the reason I call this my favorite topic is because how powerful just getting onto our thinking can help disrupt stress in our lives. If you missed it, last week, I unpacked the entire concept of stress and how you can be onto managing your mind, managing your thoughts, so that you can disrupt stress. It’s fascinating, but as a little mini-review, when we understand what our thoughts are that create stress, just that awareness alone dials down the physical feeling of it. So I want to give you that encouragement, you do not have to be a deep dive coach to understand this or to manage your mind around it. It is very simple and it’s really just a matter of slowing down your brain so you know what’s going on. So, that’s like the mini-intro, and I covered that in depth in last week’s episode, if you missed it. But today is a standalone episode, but where I am digging in on disrupting this cycle of stress and what I see it looks like and what might be happening in your life. So, buckle up. I’ve got some great news that there are some actions – you don’t need to just thought-manage your way out of stress. There are some great actions to take that really can help the biological kind of results of experiencing stress. Alright, so this is what it looks like for me. And see if this resonates with you. I might have a couple of stressful phone calls or I might spend the day really frustrated about getting something done and have a few technology bumps. And so something that I want to do in 20 minutes ends up taking an hour. And then I get a phone call with disappointing news, or just think about the day to day things that come at you that start building up stress in your body. You’re like, you know, “I’m so frustrated I’m not getting enough done.” It can be a really intense conversation with someone. It can be, if you’re growing and closing a new business, it can be discouraging results even though you’re taking a lot of action. It can just be life. And this is what it looks like for me when I’ve had one of those days for some reason. And I’m shifting this a little bit, but I’m not going to get off-track with sharing my alcohol journey with you, my wine journey, but this is what it might look like, “Oh my god, I had such a stressful day.” And you realize you’ve just missed a workout, so you have no physical way to kind of get it out of your system, and all you want is a glass of wine, a sip of scotch, a conversation with your friends to complain for hours, like you just want to get rid of that feeling. And then, it looks like this; you have that glass of wine or you have a really big meal that you feel like you deserve and you start feeling better because of what you’re doing. You’re with family or just the calming down of the wine in your system or the really great food. But then, you wake up and you’ve got a little bit of a headache and you’re groggier than you’d like to be. And, I don’t know about you, the first thing I want there is a very big cup of coffee. I want to jumpstart my day. And before you know it, you’re dehydrated, you’re not a little jittery, and now you just want to push through, even though you’re a little groggy from the night before and you just push yourself and get going the next day. What we’re doing here health-wise, what the wellness coach in me can share with you, there’s a few things that are going on. And this is what I want to help you to be aware of. In this cycle, we are simply just looking for comfort from our stress. And it is just a thought in our mind, but physically, we are feeling tight, we feel the sensation in our gut. A lot of people feel it in the solar plexus, you feel it in your stomach. For me, it makes me want to put soft food in my stomach or it makes me want to wind down with a glass of wine. Can you relate? Whether you drink or not, it’s that feeling of wanting to let go and relax. And, when you have that wine, when you enjoy the letdown, it feels really good and you feel better. But the after effects are many. I know, and I’ve been noticing, I’ve been watching this a little bit more with myself, I naturally am creating a lot of dehydration, which really doesn’t make us feel good, because I’m drinking wine the night before but need coffee to jumpstart the day. Or I’ve overeaten the night before and I don’t feel light and good when I wake up. I feel a little puffy from maybe something I ate that wasn’t my fuel or I just don’t feel that great. And I start pushing myself through instead of just waking up and getting on with my day. And that pushing through is almost like selecting or choosing to be stressed, operating in adrenaline, to get going the rest of the day. And I feel like, sometimes, that’s what sets us up to get triggered with more of the conversations, because we already are just not feeling that great, and now we’re just pushing through to have another amazing day and we are living in an adrenaline bath. I had an experience in my life that I lived this, and I want to share it with you and what I mean. And many of you might be living in this right now. And I want to encourage you, there is a beautiful way to disrupt that, and I’m going to be giving you that at the end of this call. But recognizing the cycle we’re in and how to gently disrupt it first can come from acknowledging that we are pushing ourselves, we are constantly feeling on edge, we are constantly looking for comfort to kind of dial it down at the end of the day. And just be kind here. This is your life. We experience a lot of natural stress just listening to the news, for one thing. But the lives that we’re living, you know, really do naturally create a lot of adrenaline rush in our lives. And then, we kind of put ourselves in our own cycle of being high achievers, pushing to do a lot, and then experience that push kind of stress, that kind of self-induced stress. Well, I had a season where this almost took me out. And I look back and I realize actually, in talking with a lot of my clients, that this is like the beginning of creating almost like a physical burnout. When we decided – and I was more the leading energy on this between my husband and I – when we decided to downsize and sell our home, we were waiting quite a while for the market to pick up in real estate. And so, it was a little fearful. You know, are we going to be able to sell our house? And we had 30 years of storage in that house, so we had a lot of work to do to prepare ourselves for being on the market. And during that spring, I was working part-time. My husband was a little reluctant, but really still, we both were agreeing that we’re going to put the house on the market, and we just listened to all the advice we got. So we cleaned out our basement. We moved big furniture downstairs. We painted the walls white. We got the windows fixed. We did everything a realtor said because we were coming into a very cool market at the price range we were at. And we physically were working all the time. We were cleaning out rooms, we were calling – I’m embarrassed to tell you how many trips to the dump and trips to Salvation Army and Goodwill we took. It was embarrassing how much stuff we had in our house. So you can know, we were, like, holding onto a lot of stuff. And this was the letting go. So it was just really stressful. Well, what happened is on the end of this journey of selling our home – we did sell it. We did, at the very last minute before having to store all this junk and furniture, we found a new place to live. But it needed some freshening up. We had a lot of work to do. My friends, I have never been so stressed in a consistent fashion in my life. It had been a long time since I had had a career, corporate job, a sales job. It reminded me of those days. And we were literally getting up early every morning. I would go work my part-time job midday. I would come home and we would clean out a new room, we would spend the entire weekend on our feet. And I was bathed in adrenaline. And then, I had my son’s wedding; something I really wanted to enjoy, but there was a lot of work. And during that season, I was again physically at it all the time. We had found our new home, but now we were getting it ready in time, in two and a half weeks, ready for guests for the wedding. We did it. We did it with help, but the weekend that I remember I could relax, I couldn’t. My body was so used to that adrenaline bath that when I decided I could rest, my body shut down. I know that there was something cortisol going on with it. I did do some blood work and I did get better and back on my feet in two weeks or so, but I know that this was from pushing myself hard all day, winding down at night with alcohol. And I wasn’t overeating, per se, during this season, but I wasn’t eating probably often enough. We were pushing ourselves really hard physically and actually both lost a lot of weight unexpectedly. But I was bathed in that pressure. And it was one of the unhealthiest seasons of my life, and yet, here I walk into a wedding season of my son’s and I wanted to enjoy it. And what I noticed after that is that I had been getting my body – and it will react this way – so used to being pushed that it couldn’t get motivated or get moving without it. And if you’re in that space, my friends, I want you to get up the phone and give me a call because there are beautiful ways to take care of yourself when it’s been this long. But I was shut down, probably for two or three weeks, where my body had to get used to not being under stress anymore to get moving in the morning. And it was awful. This is what I think we’re doing in our society. We are pushing ourselves all day and then going to comfort all night and it is really hard on us. This is the cycle of stress. Now, I’ve given you the most extreme story to kind of understand or maybe relate to where you might be, but it can be as simple as winding down at the end of the day with habitual alcohol or overeating. And, of course, this gets my clients’ attention. This is where we start unwrapping that pattern because they are trying to lose weight and these are the moments where they’re overeating a little bit or as a pattern, overeating every night, maybe even just a little bit, is creating weight maintenance or weight gain. And this can be interrupted. Obviously, this is a space where we can use our food tools and everything else, but what really works here is getting to the bottom of our thinking and knowing the way out of this cycle. So, if you are in that place where you are experiencing a lot of stress during your workday, then you calm down with food or any outside sources. And another one might be social media. There’s a lot of ways we buffer. And what I mean by buffer is that when we feel a negative emotion, instead of really honoring it and going, “Oh yeah, I am really angry at my partner because of what he said today…” that would be kind of being onto what was going on for you, and kind of allowing the emotion and dissecting and deciding something to do about it tomorrow as you process it. That would be, kind of, allowing what was going on in your life. But then there’s buffering. You know, there’s bad news. I don’t know, when a really awful event happens on the news, I might end up buffering on social media, where I take time to look at good stories and just try to feel better. That’s what I mean by buffering. We buffer with food, we buffer with alcohol. And buffering, really, in my definition is just using something outside of us to feel better. There are really other more powerful ways, especially if overeating and overdrinking are getting in your way of your health, to manage that. And that’s what I’m going to offer today. And there are three. So, I gave you the most extreme example of where we have almost adrenal shutdown. But that was just to show you that what might be going on for you, if you’re using alcohol and food during the evenings to calm down, you may be now using a jumpstart during the morning to get yourself going. And if we stop the buffering step at night and use other more life-giving ways to approach our stress – and not perfectly, I still have the celebration bourbon at the end of a big week and I still use social media to feel better in moments. But I’m not relying on them as heavily with these three steps. And these are things that I offer to my clients as they’re trying to lose weight. There are so many beautiful ways that we can take care of ourselves in these moments, and these are it. And that, again, is unpacked in last week’s episode. So that is this step one. That always is an option for you when you are feeling stressed. But there are others in taking action, and these are the three. Move to sweat it out. Sweating it out is one of the best ways to help your body rid yourself of just the natural stress that happens living a human life and living a fast-paced life that you live. Next, it would be flowing it out, and I’ll explain what this means, but gentler exercise sometimes is warranted as a way to help you kind of flow through what is going on for you, not sweat it out in a more active state. So they’re really two different things. So, move to sweat it out, move in a way to flow it out, as I’ll call it. And another is to get in your body more. And that would be meditation and yoga. Let me explain how these work and why they’re so important, and that even if you chose these three things three different times during your day as your new way to move, they might help you dial down stress at a totally new level, that you would not always be habitually reaching for alcohol, reaching for food, or buffering yourself with a lot of social media instead of enjoying your family or instead of getting some work done. Alright, so these are the action steps to take; move more and sweat it out. Are you offering yourself or making sure you plan at least one or two – and I recommend two at least – sweat opportunities during the week? There is something about – and I do not know how to explain the biology of this – but there is something biological that we hold, even as much as you do a lot of thought work around something or a lot of understanding, you will always hold, almost chemically in your body, some of the stress you experienced. And one of the most beautiful ways to get rid of that and almost get the toxins of stress out of your system is to have a good sweat. Recently, I have realized, I not only have had a goal of losing a little bit of weight this year, but much more, I’m paying real close attention to my ideal week. And my ideal week does include at least one high-intensity workout, if not two. And this has changed everything. I am noticing my productivity and distraction really dropping. I am so much clearer and I think it’s from that natural clearing of the stress, of worrying about some of the events I want to fill or worrying about anything any business owner thinks about. Maybe you can relate, that if I get that stress workout, I might think of some ideas on the bike, but more than that, I just feel cleansed and clear. So I offer to you that one of – and is it a quick run? Is it a 15-minute 90X or is it some HIIT workout, high-intensity workout on the internet? Is it just getting to a class, like a hot yoga class, where you really sweat it out? Is it even going to a sauna? If you can’t be that active because you’ve had a physical limitation, you know, getting to a sauna at your health club? Sweating it out can be so, so beneficial. I may start studying this more and understanding what’s happening, but I know, for me, that my life has changed. This month, I got four cycle classes in since the 31st of January and I am operating in a different zone, so I highly recommend it. and I know it’s because it’s ridding me of some of that distracting stress thinking. Alright, so, number one, sweat it out; 15 to 20 minutes at least once a week. Next, flow it out. What do I mean by this? There are some days that my body is actually recovering from a high-intensity workout or a big weightlifting night and I know – or that’s not even your gig, and that’s fine. That’s the level I work out at, but it is taking an opportunity of – it will be the moment where I say, I just need a good walk, or I just need a yoga class. I just need to be on the mat for about 15, 20 minutes, and just flow it out. And this is motion, but gentle. And this is motion; this is not meditation. I am talking about choosing at least once a week, again, it could be your second activity, of taking a really healthy walk. Most people that like to walk, it becomes beneficial or they say that really, the ideal is 30 to 40 minutes. And I really agree with them, but get anything you can in. Take an opportunity to move and flow it out of your body. This is where – I don’t think it’s the toxic release. I think this is more meditative, help your brain get in a really good space. It’s when you have work for three or four hours creating content or you have been in meetings all morning and you go and get your shoes on and get outside for lunch and just let the ideas flow, let the conversations that you’ve had flow, and just – it doesn’t matter what you think about. Don’t set an intention, just go and move. This is where I know I need a yoga class, and I really go and get – it is more than just thinking or, you know, Savasana on the mat or meditation. For me, it is getting motion and movement and walking. Sometimes, this is when I can‘t get away, that I actually do things in my home as a break. Like, I work at home, so I go do the laundry, I fold laundry. I just get in motion for as long as my break allows. So, again, to undo the physical stress feelings in your body so that you’re not reaching for the alcohol, the extra meal, so that you’re not pushing yourself so hard, what would it look like to, once a week, flow it out. And plan it on your calendar and honor it. Alright, last but not least, this step is the more still step. This is something I do in the morning and I call it getting in your body. And there are a lot of reasons as a weight loss coach or as a wellness coach that I recommend this. You know, we wake up very naturally. It does not have to be done in the morning, by the way. But this is taking time to just be still. So, I have a morning routine. It differs a little bit every morning. But I get on the mat every morning and allow my body to release tension. It is two simple poses. If you know yoga, it’s a child’s pose and a legs up the wall, because I have very tight hamstrings and they hurt my back. And so, at the minimum, whether I’m in a hotel, whether I’m on the road, I do these two moves every day. And it is a moment of stillness. I’ll notice the crappy thinking that most mornings I wake up with a little bit of an, oh my god, what’s going to happen today? I don’t know why. But that’s our brain, leaning towards negative all the time. And one way that I have just felt more centered, as I reach for my coffee or tea later, is if I’ve had this quiet time on the mat and a little bit of quiet with my journal. And I call it the power of getting in your body. Getting into that place where you know you’re an amazing human, you know that those thoughts are just your thoughts, that you really just take some time to let those thoughts flow by. And it can be a deliberate yoga practice. I highly recommend it if you’re drawn to this. And it is just taking 10 or 15 minutes – and I’m just going to recommend, if you’re not doing this already, once a week, to get in your body. Why do I recommend this? Because when we allow thoughts to flow, we can then intentionally think what we want to think during the day. But if we’re always in that state of feeling the angst of fearful emotions and kind of that low-grade discussion in the background that just goes on in our mind – these are just thoughts in our mind that flow by – I’ve noticed that when I get more in my body, I am more insightful. I know when I’m hungry. I know when I’m full and I get more intuitive about who to call on the phone, about something new. I am just my better self. And we all have that space where we know that we’re different than an animal that just reacts to everything. We can watch our thinking, and this is a powerful place that you can watch your thinking. I love that a lot of my podcasts are all about changing your thinking. And that is the most powerful work you can ever do, is start being the manager of your mind. But these are three action steps that if you started putting them on your calendar, of sweating it out at least once a week for 15 to 20 minutes, flowing it out by a gentle way of exercising or moving or walking, and three, at least once a week, meditating, or being calm on a yoga mat or however you feel comfortable, in your breakfast chair, you know, taking that time to be quiet. What would that add to your life? You know what I’m seeing? I have never shown up so powerfully in my business than I have this last month. And I am seeing results. I am being asked to speak. People are coming to me for coaching. That’s my business, right? What is it for you? What would you most love to happen in your life right now? And those things that you most desire, the things that you most want to grow in in your life, the things that you most want for your business, the distraction of stress will pull you away from them. And by following these three key things that I have learned that have made a huge impact on me, and I’m watching it take huge impact on my clients, is making all the difference. You want to know the results of getting in your body and starting to manage your thinking? I’ll give you three outcomes that I’m seeing in my clients. One, I’m sharing with you, I’m my own best client. I am seeing things happen in conversations that I’m having with others that are so powerful that I know I’m making a difference in the world. It’s amazing. So that’s one. Two, I am working with a person that has lost 11 pounds, that about six pounds ago, she thought wasn’t even possible, and now is showing up in her business in a way that she is being asked in for a very, very high upper-level position, and I know it’s because she is showing up differently because she’s taking care of herself. And as a last powerful example, I have another client. In the role that she’s in, she really knows that she is a leader and a supporter in the same role with her company. And as she has gotten onto really managing her mind and starting to take really good care of herself, like stopping work at five, she’s really learning to manage the stress and fear of really big growth in their company, that she is now showing up in conversations that she is not as tight, she’s not as frustrated, she’s not as angry, and she is able to continue in this role of really supporting her team in the way that she knows is powerful. Don’t you want that for you? This is amazing work, my friend. It is miraculous and I invite you to take these three steps – and they sound simple and very coachy, but they are so powerful. Definitely always use self-coaching and manage your mind. That’s your bonus. But three, sweat it out, flow it out, and get in your body more, and you are going to see amazing results in your life. That’s what I’ve got for you today. And what I’ve got upcoming you do not want to miss. I am going to start plugging into my calendar some, like, webinars. They’re basically coach calls where you can come on and they will be either weight loss focused or stress focused, either one, because I feel like those are the two areas where we can really get results by even following the few tips that I’m going to share during these webinars. But if you want to be invited to those webinars, you’ve got to let me know. I have a list and I have a great opt-in on the front page of my website called Lose Your First Five Pounds. Now, even if weight loss is not your goal, by opting into that, you are going to get some insight of amazing self-care. And if you click and enter on that list, you will get invited to those webinars. Now, if you do not want to receive emails from me, I am totally fine with that. Just send me an email, info@dianamurphycoaching.com, and I can either put you on a separate list where I just invite you to those webinars, or I will personally invite you. Alright, that’s all I’ve got for you today. Don’t miss what’s upcoming in Diana Murphy Coaching. And I hope, by now, when this podcast comes to you, that it’s starting to warm up in your world. Have a great day.